We’re still working our way through the sweet potatoes and carrots from the CSA. And I’m still fascinated by star anise. This is a nice way to incorporate both. 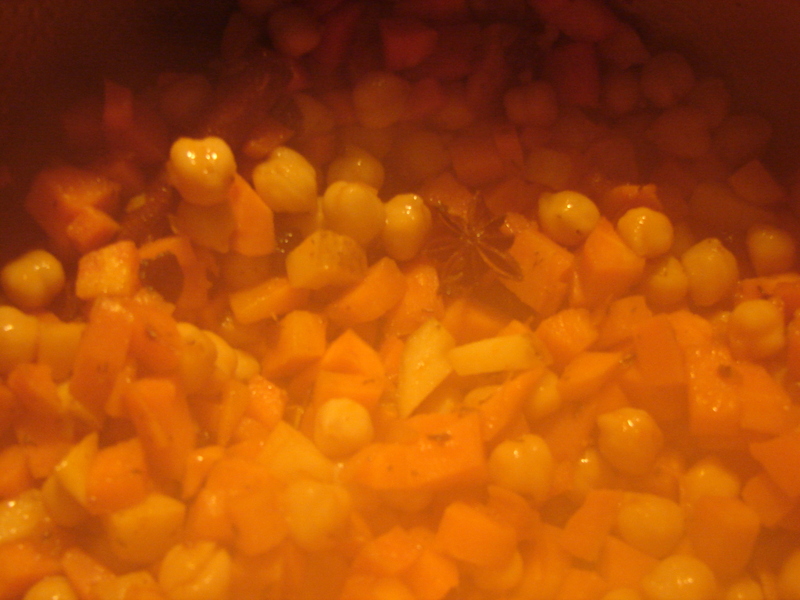 The pleasing texture of chickpeas goes well with the sweet potatoes and carrots. 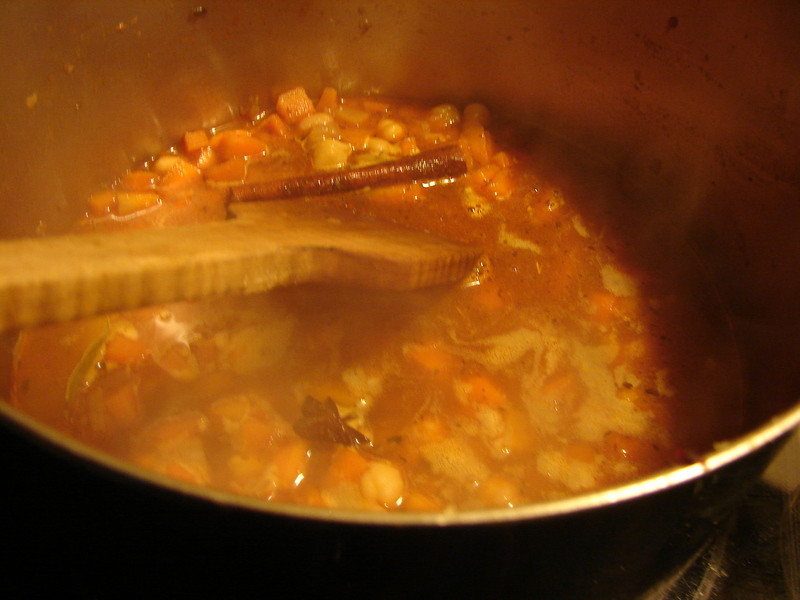 The mild sweet flavors blend with the slight dryness of the wine to make a rich, unusual broth. Sage and thyme, star anise and cinnamon – delicious together. I made cornmeal dumplings, but lighter and less stodgy than you would expect. Did you know that Neil Diamond wrote Red Red Wine? It’s true, he did! 1. Warm the olive oil, add the shallot, when it starts to brown add the carrot, the sweet potato, potato, then the herbs and spices and the tomato paste. Stir it all together and cook until the pan starts to dry a bit. Then add the chickpeas, and continue to cook until things are heated through, and the pan starts to form a bit of a film of spices. 2. Add the red wine and scrape the bottom of the pan. Cook through a few minutes, then add water to cover. Bring to the boil, then reduce heat and simmer about 20 minutes until the carrots & sweet potatoes are soft, but still have a bit of crunch to them. 3. Just before serving, add the butter and balsamic, the salt and pepper. 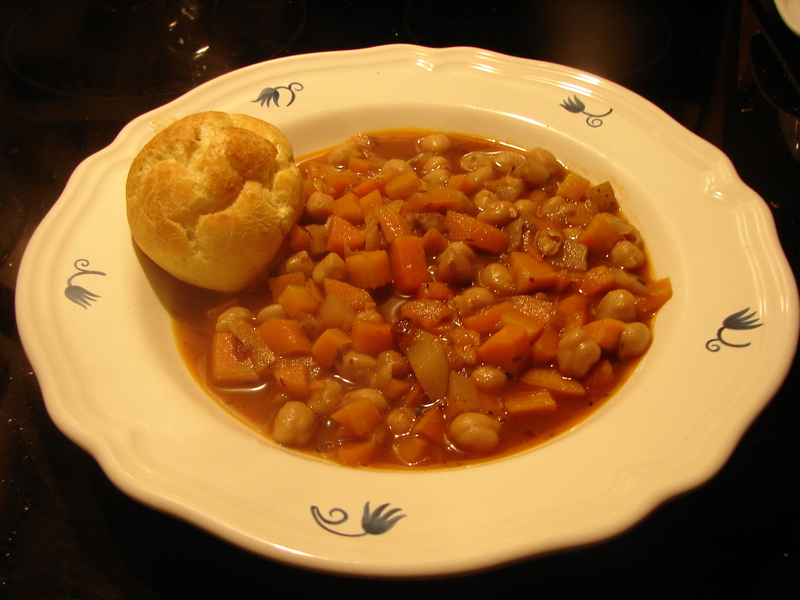 This entry was posted in potatoes, recipe, soup and tagged carrots, chickpeas, cooking with red wine, dumplings, star anise, sweet potatoes by Claire. Bookmark the permalink.